Published: Jan. 17, 2019 at 10:53 p.m. Updated: Jan. 18, 2019 at 03:17 p.m.
As we enter the 2018 Conference Championship weekend to find out which two teams will be headed to Atlanta for Super Bowl LIII, let's take a look at some Mind-Boggling Stats of these two matchups. Despite passing for 391 yards and 3 touchdowns, Jared Goff's effort was bested by Drew Bree's, who threw for 346 yards and 4 touchdowns. 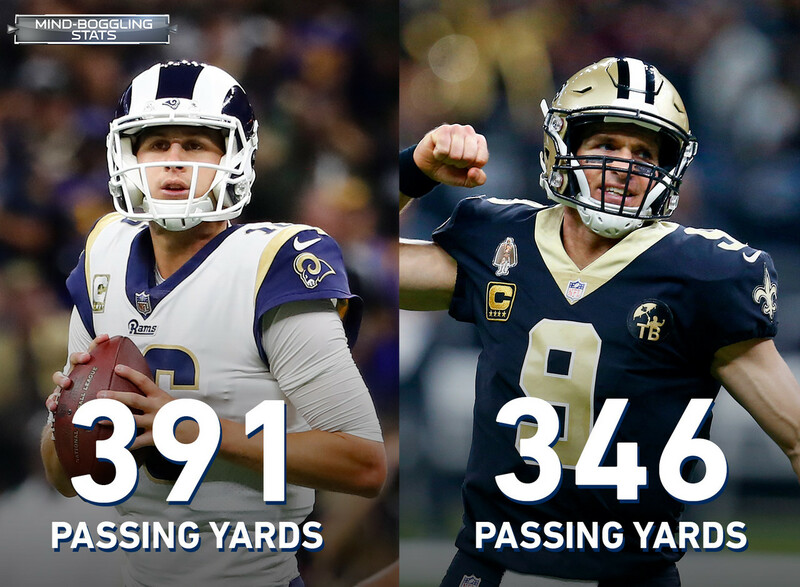 Looking ahead to this week's showdown, the Rams and the Saints have been two of the most prolific offenses in the NFL in 2018. The Rams rank 2nd in points per game (32.9) while the Saints trail closely in 3rd (31.5). The Rams and the Saints are also the only two teams to average 28+ points per game in each of the last two seasons. The Rams have lead the NFL with 232.3 rush yards per game (including playoffs) since signing C.J. Anderson in Week 16. Gurley and Anderson became the 4th teammate duo to record 100+ rush yards in a playoff game in the last 30 postseasons in their Divisional round win. Alvin Kamara and Mark Ingram have scored 18 rushing touchdowns, the most rushing touchdowns this season among running back duos. Since 2017, Kamara and Ingram have been the most productive teammate running back duo. Aaron Donald leads the NFL with 20.5 sacks, 41 quarterback hits, and 73 pressures. This is the most amount of pressures by an individual player since Next Gen Stats began tracking the statistic. Donald joins J.J. Watt as the only player in the last decade with 20+ sacks and 40+ quarterback hits in a single season (what did this in 2012 and 2014). Michael Thomas set a Saints single-game franchise record with 211 receiving yards in Week 9 against a Rams team missing shutdown corner Aqib Talib. Will things be different this time around? Consider this, with Talib in the lineup, the Rams have allowed 13.5 fewer PPG and 15 fewer pass TD than they did while he was out of the lineup. The Rams also had twice as many interceptions with Talib (12) than they did without him (6). The Chiefs' span of 52 seasons without hosting a Conference Championship was the 3rd longest in the Super Bowl era. In Mahomes' first season as a starter, he has put up a season comparable to Brady's best single-season career highs in most major passing metrics. Brady has a completion percentage of 68.9 and Mahomes' has a 66.0. In passer ratings, Brady has a 117.2 whereas Mahomes' is close with a113.8. Tyreek Hill has at least 130 receiving yards and 1 touchdown in each of his two career games against the Patriots. In each of those two games, Hill has caught a 75-yard touchdown pass. Hill has also averaged the most yards per game (137.5) against the Patriots of any opponent since 1970. Travis Kelce's 1,336 receiving yards this season edges out Rob Gronkowski's 2011 record of 1,327 receiving yards in a single season by a tight end. Kelce trails San Francisco 49ers tight end George Kittle's recently set record by just 41 yards. Andy Reid and Bill Belichick have 497 combined wins � the most all-time by opposing coaches in a playoff game. A victory over Kansas City would put Brady and Belichick in their NFL record 9th Super Bowl appearance. The Patriots have advanced to the AFC Championship 8 seasons in a row. For Brady, this is his 13th conference championship appearance, a record high in the Super Bowl era.